Through many years acting as "Approved HazMat Company" by DNV GL, we have knowledge of all types of vessels and all types of tasks. Dr. Berg has developed and performed training courses for HazMat experts worldwide. 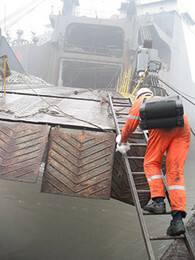 We are your partner to realize Inventories of Hazardous Materials (IHM) for existing and new vessels. Based on our IHM your classification society will issue a Statement of Compliance. Our in-house laboratory is equiped with four ZEISS scanning electron microscopes. This enables us to analyze asbestos with a detection level of 0,0008 %. Our laboratory is accredited by DakkS and many clients throughout the shipping industry are relying on our know how. Our laboratory is also used by external HazMat experts and third parties. Having combined laboratory staff and HazMat experts under one roof is the best way to ensure quick response time with a maximum level of accuracy.